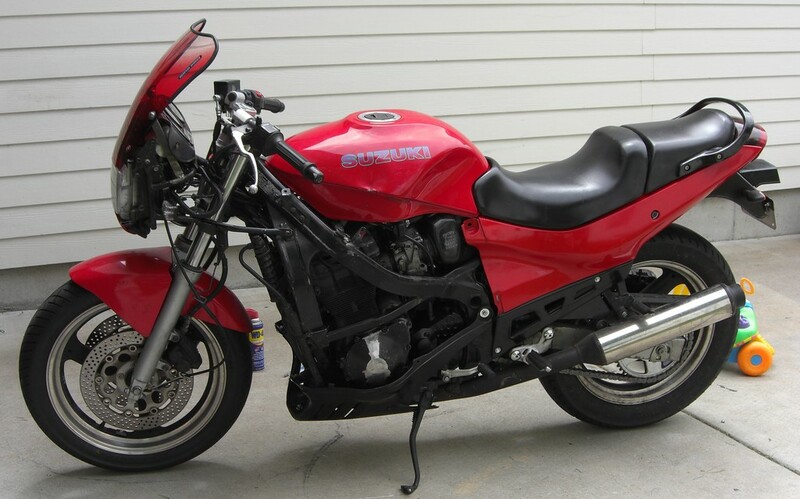 This is the first sport bike I bought. It needed a lot of work when I got it, so I've taken a lot of pictures of it as I've worked on the bike. The dent in the gas tank and the bare metal stripe on the engine cover are related. The first morning I had it all done, I rolled down to the end of the driveway to leave for work. The trash cart was sitting by the curb and I decided to take it in. I put the bike on the kickstand and let it idle. I had just made it to the cart when I heard a bang, and turned around to see the bike had vibrated off the stand, denting the gas tank with the handle bar, and cracking the engine cover open, spilling oil all over the driveway. I mounted the engine cover to some boards to hold the crack shut and keep the cover flat, then took it to a local shop and paid a guy to TIG the cover back together. Had I remembered to grind the kickstand stop like it had been suggested to me, it probably would not have fallen. I've also installed a centerstand since then.